You must carefully document the shipping arrangements you make for your international customer. You want your export sale to be a complete success, and this is a critical phase. The documentation for a transaction follows the same pattern as that for a domestic sale. When you sell your widgets (or as in this case, ‘hairbrushes’) to your customer across town, you invoice them, right? That's where you start with your overseas customer. Sometimes your local customer will have special requirements for the order, such as a packing list or specified outside markings on each case shipped. Your export transaction will have special documentation requirements, too. These will vary according to the country of destination and the type of goods shipped. If you've selected a freight forwarder or logistics company that has a history of shipping your type of product, they should be right on the ball about the current documentation requirements. For example, the old Shipper’s Export Declaration (SED), now called Electronic Export Information (EEI), compiles U.S. export statistics and enforces U.S. export laws. The EEI must be filed with shipments from the U.S., Puerto Rico or the U.S. Virgin Islands to overseas destinations; between the U.S. and Puerto Rico; and from the U.S. or Puerto Rico to the U.S. Virgin Islands. Not all shipments need EEI. That's why a freight forwarder comes in handy because they can advise you accordingly. If a shipment of merchandise, for instance, is valued at more than US $2,500 and is sent from the same exporter to the same recipient on the same day, it will require the filing of EEI. Or, if a shipment, regardless of value, requires a permit or export license, you'll be required to file EEI. If you are not mindful, plenty. Mindful meaning you may not have the knowledge of rules and regulations and are not careful enough (e.g., typos or entry of information is placed in the wrong boxes). Shipping Solutions has come up with six things that can go wrong when creating export documents. Here's a look at their list but we suggest you visit the site to explore deeper on each point. Wrong contact, packing, and payment information. Having the wrong person fill out dangerous forms. Wrongly assuming your goods qualify for preferential rates. No matter what, always take the initiative, and ask a lot of questions to your freight forwarder or logistics company. Use their expertise to your advantage, so you don't make any of the costly mistakes noted above. Commercial invoice ("How to Prepare a Commercial Invoice"). Certificate of origin (as shown and where applicable – "Country of Origin Certificate"). Three (3) original ocean or air bills of lading, and copies. Payment instrument ("Factors to Consider When Choosing an Export Payment Method"). Your delivery terms affect how and when you get paid. Incoterms guide you when risk passes, and how costs are allocated between seller and buyer. 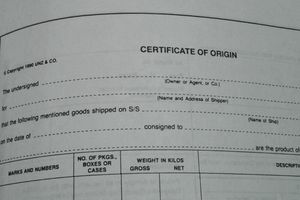 Other important, relevant documents required for some destinations and some commodities: copy of proforma invoice, inspection certificate, consular invoice, import or export license, insurance certificate, dock and warehouse receipts, health inspection certificate and IATA shipper's certificate of articles not restricted or for dangerous goods. UPS, for instance, offers a variety of forms (e.g., commercial invoice, packing list, NAFTA Certificate of Origin, U.S. Certificate of Origin and Electronic Export Information) for international shipments. We will review each document thoroughly here at this site over time so you will feel comfortable preparing it. There are software programs available that will execute your export documents electronically. As your business grows, you might consider installing one or even looking into using a sophisticated ​logistics company that offers this feature as part of their worldwide service capability.